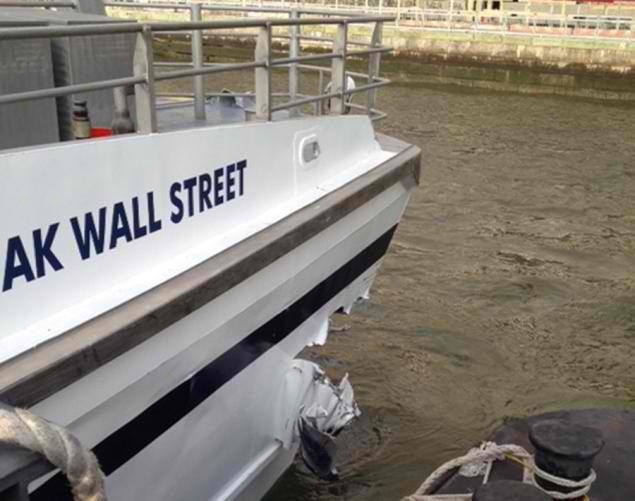 While details are still scant as to what exactly with the propulsion/control system caused the high speed ferry Seastreak Wall Street to collide first with a loading barge and then a slip at pier 11, the media can already smell the blood in the water and are spouting just about any kind of drivel they can, regardless of the facts. This article in the NY Post is smack with errors about the vessel’s propulsion and maritime terms, yet the general public with lap it all in thinking they have been informed. It even quotes a passenger as saying “there was a rattling sound, like something caught in the jet”. Which could be true, if the vessel had jet drives. It also went on to state that the crew refused to speak to probers and waited for company lawyers. Bravo on them, it is hard to resist the temptation to vindicate yourself in the moment, however waiting for lawyers is the best thing to do when the USCG and NTSB is involved. Thats not just my opinion, thats the opinion of a USCG accident investigator who spoke to my casualty analysis class senior year. The bottom line is the modern media needs to learn to do a little research into what they are reporting on, instead of just writing down whatever sounds the scariest. Journalism isn’t about copies sold or page views, it’s about the honest truth. So until the NTSB finishes their report, don’t call for the captains head just yet. Certianly don’t read any of the drivel spewed by Don Amira at nymag.com. If you want to read a good article about the incident the best I can find is this one from Huffington Post. Clear, concise, and by god, filled with facts! This entry was posted in marine incidents and tagged bad journalism, new york city ferry accident, Seastreak Wallstreet. Bookmark the permalink.